I just got my internet sorted out when an even bigger - and more serious - disaster happened! Those of you on Facebook already know that I posted from our local A&E yesterday evening because my sweet mother went flying on the bathroom floor and was rushed into hospital in an ambulance. It turned out, at ninety-two, she had broken her hip quite badly! I was frantic. I stayed with her until 01:00 this morning and left when they took her up to the ward to make her as comfortable as possible for the night, and said they would operate tomorrow (today). It broke my heart to see this sweet angel crying out in agony whenever they tried to turn her or do anything. I went home in tears. She had the surgery this afternoon 15:00 and was out of surgery and back on the ward by about 19:30. They said that surgery had gone well and she was dozing. I told them that I would let her rest and would visit her tomorrow. To take my mind off things a bit, I decided to make a card for her while I was waiting to hear news. I used a Penny Black stamp of her favourite flower - an Iris - I suspect, because that is what her name is, and a little sparkle (as she loves anything that sparkles and shines). Here it is, I couldn't quite get the colours perfect, I think the closest is probably the one with the ink pad in the picture. My thanks to everyone who sent words of love and caring thoughts. When I tell mum she will be thrilled at the generosity of strangers, who are friends! As always, thank you so much for your visit today and especially if you have left a comment. You are all appreciated more than you know! hope your Mum makes a great recovery - will keep her in my prayers - you too. 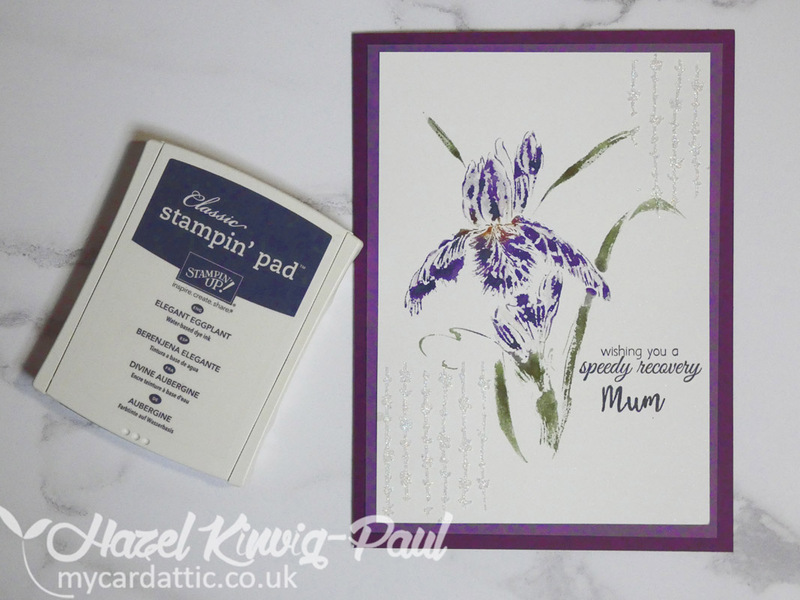 she'll love the card, i'm sure - amazing how making a card can keep you sane - it's so wonderful we have this hobby. 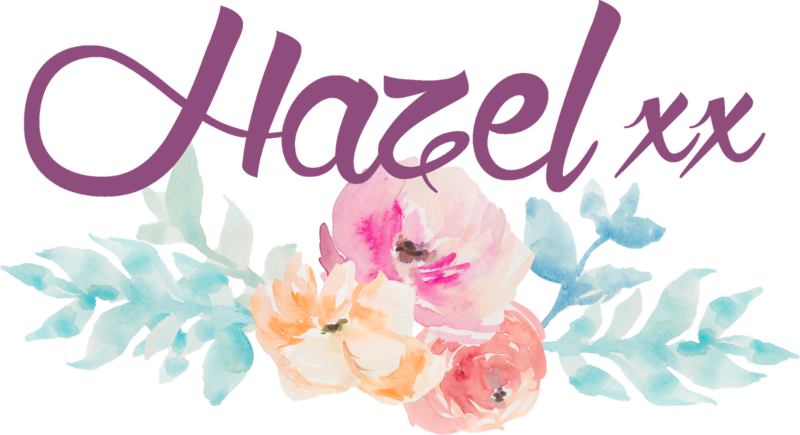 Hazel, I am so sorry for the pain your mum is in and pray that she is feeling a lot better soon! How scary for you, too! 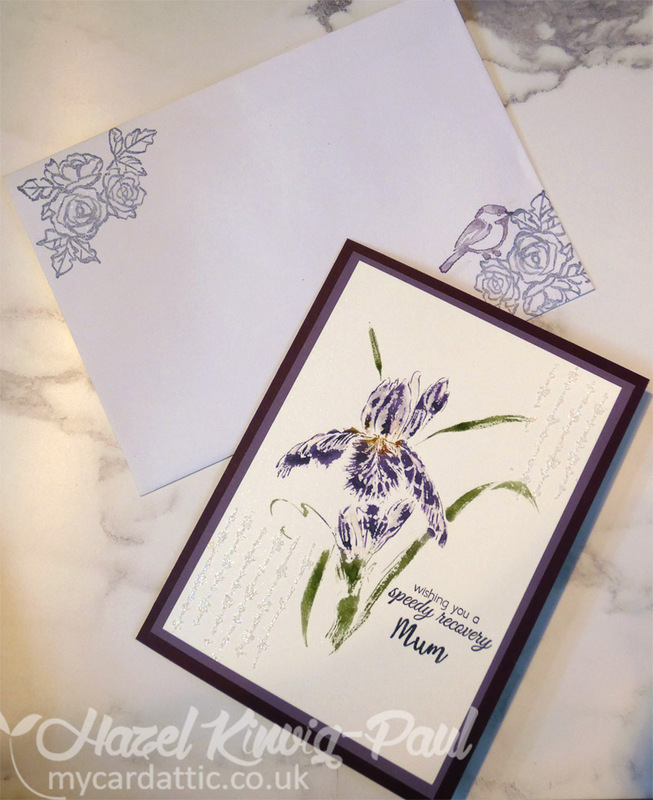 Your card is gorgeous I am sure it will bring a smile to her face! Oh your poor Mum, Hazel - hope she heals quickly! 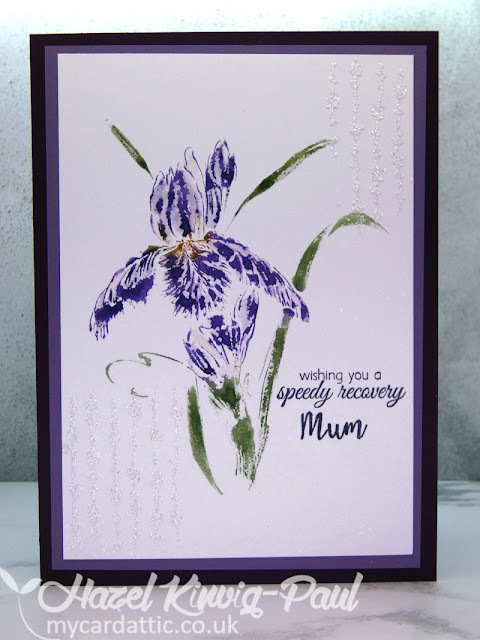 That stunning iris will surely cheer her up!! Oh Hazel, what a worrying time. 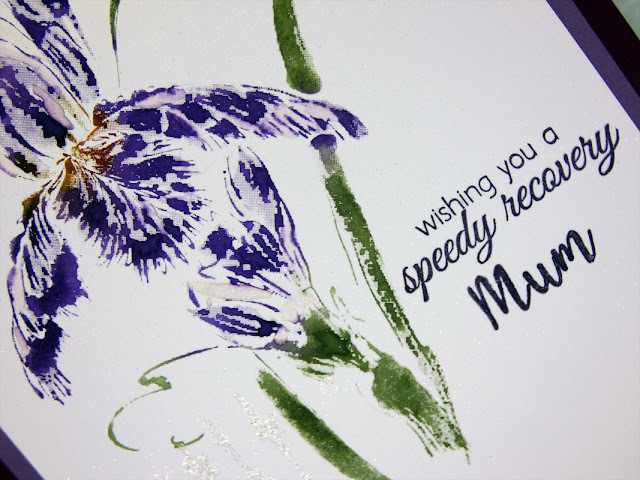 I do hope your Mum is soon up and about - although I was only in my 50's they had me out of bed the day after a replacement - which is what I suspect your sweet Mum may have had. Main thing is getting confidence back and, if at all possible where you live, aqua therapy helped me enormously (at a cost needless to say) - both in terms of getting used to moving around freely as well as building confidence. Bless her - thinking of you and hoping you feel more settled tonight. Oh my gosh, Hazel, I am so, so sorry to hear about your Mom. I am praying for her and I hope she recovers quickly and the pain goes away. I am praying for you too, my friend. I can't imagine how hard this is for you. The card you made for her is absolutely stunning!! The iris looks amazing!! I love the colors and the sparkle you added!! Thinking of you and sending lots of hugs and prayers your way. 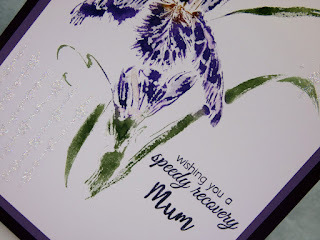 Lovely card Hazel...so beautiful. So sorry to hear about your mum, sending hugs and prayers your way. P.S. 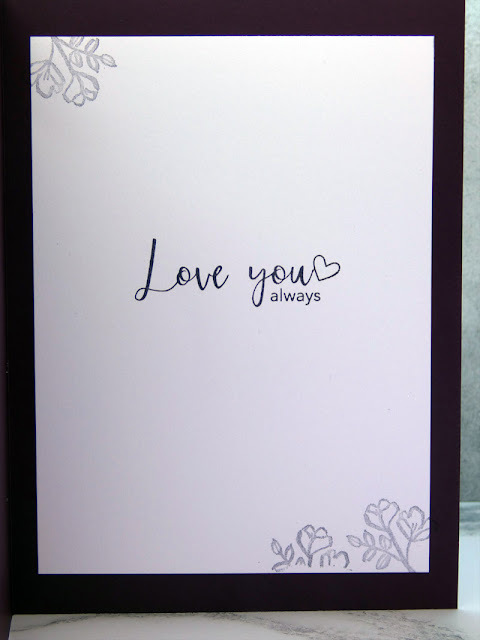 she will love your beautiful card made with so much Love. Hugs..
Oh, my goodness, your Mum has had a very rough time of it. I do send her my very best wishes for a full and quick recovery. You take care of yourself, too, Hazel. It's often equally difficult for the caregivers. My thoughts are with both of you! Your card is so lovely. I love irises, too, and yours is perfect. Oh Hazel, I'm so sorry to hear of your mum's fall. I hope now she has had the surgery she is feeling Moyer comfortable and wish her a very speedy recovery. Lots of love being sent to you all x Beautiful card. WOW! Phenomena card, Hazel !!! Wonderful card for your Mum Hazel. Its good to hear she had a good surgery and is on her way. No doubt she'll love this card from you, amazing that you could create such a lovely card in the midst of this crisis. Well done. Hugs! Prayers continue. What a beautiful iris, Hazel! I have this stamp in my NBUS box and I think I need to get it out soon! My neighbor has a beautiful bed of iris that is blooming right now. They are so pretty! Oh my poor thing your mum Hazel. I hope she recovers soon. And hopefully without too much pain. I know what I speak off lately. Give her my greetings and get well wishes. Stay strong love. Oh no, Hazel, I am so sorry to hear about your Mum! Wishing her a smooth and speedy recovery! The beautiful card you made her will certainly cheer her up! Love the sparkly accents! Hi Hazel. I hope your mother recovers quickly. She will be in my thoughts. Your card is beautiful. Kisses, my friend. Just playing catch up, Hazel. Hi Hazel, Oh how awful for your mom! I hope by now she is well on the mend, but I know that healing is not easy as we get older. My heart goes out to you and her. Your card is beautiful and I'm sure she loves it. Irises are gorgeous, and yours looks so life-like. Just catching up as I recently had surgery and I'm still on the mend. Thinking of you, my friend!